Chunk and Monk were a “staple” here at Blue Moon Rescue. In April “they” adopted Sally Salisbury & Brady Bottoms and just moved right in with them in Prescott. It was truly a match mad in Heaven. 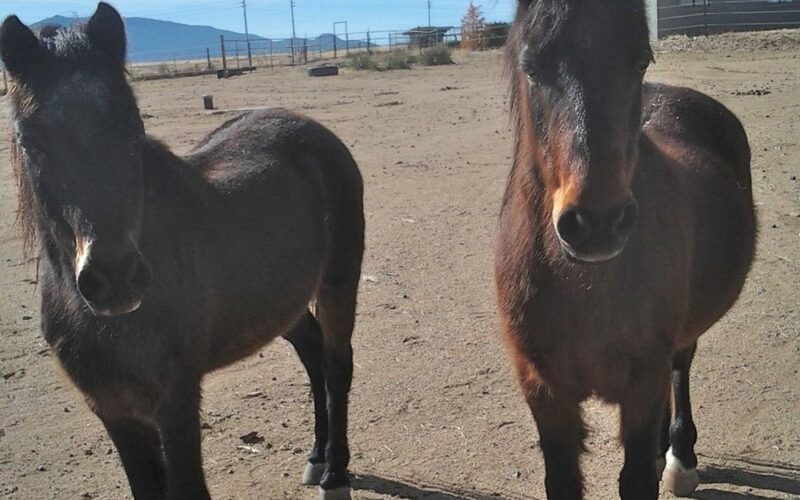 Chunk and Monk are an inseparable pair of gelded bay Hackney Ponies who would make great companions but must stay together. We are pretty sure they have been each other’s only security for many years. Chunk is the bigger one, about 19 years old and Monk is a bit smaller very dark bay about 25 years old. Both have trust issues, but Monk more so. We are told the deep scars on their necks & shoulders are the result of a wreck during their days as Amish cart ponies. Supposedly they then landed in Tucson where they were roped. Thankfully they were purchased and rescued by some very kind folks who ultimately brought them to us. At that time they joined the TAILS herd. Both are easy keepers and fun to watch when they prance around in sync with each other.